This post contains affiliate links! It means that if you click on the link and buy a product, I will earn a small commission to no additional cost to you. Thank you for supporting my blog. You are AWESOME! Postpartum weight loss is one of the biggest concerns for many mothers. While expecting women tend to believe they could bounce back to their pre-pregnancy weight (and body shape) pretty fast, the truth is, it might get a while to shake the baby pounds off. The weight you gained during pregnancy won’t just magically vanish when you give birth (well, some will, but not all of it). 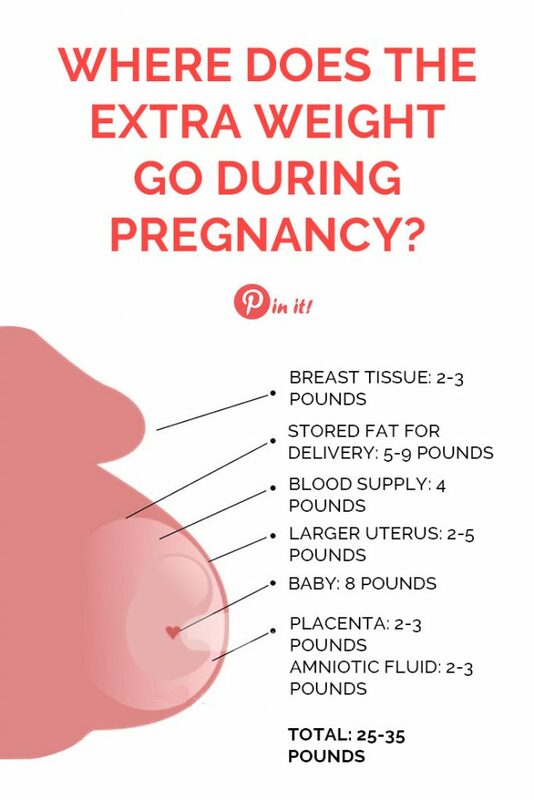 How fast you will be able to get your body shape back after delivery depends on many factors, the most solid of which is how much weight you gained during pregnancy. How much weight you lose after delivery? The average pregnant women loses around 12 pounds the moment she gives birth, and that’s a pretty good start, right? Considering, that a healthy weight gain during pregnancy fluctuates between 25 to 35 pounds. In fact, when you give birth, you will still look pregnant, because your uterus needs time (around 6 weeks) to shrink back to pre-pregnancy size. Your breasts will enlarge even more, so you may gain couple more pounds here. In theory, by week 6 postpartum, your body should get rid of the extra weight it gained to ensure baby’s growth and delivery. But in the reality it’s not always like this. The best advice I could ever give here is just to RELAX and embrace your new you at least for the first couple of months postpartum. Give your body a chance to rest and restore its resources without pushing it to the limits. Don’t focus on losing weight, focus on sleeping, eating healthy and nutritious meals and creating a stress-free environment at home. 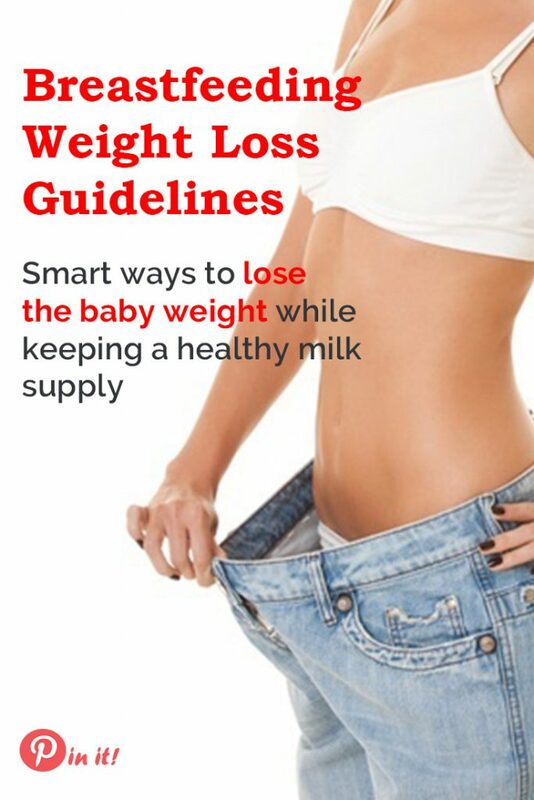 Now let’s dive into the guidelines for postpartum weight loss. 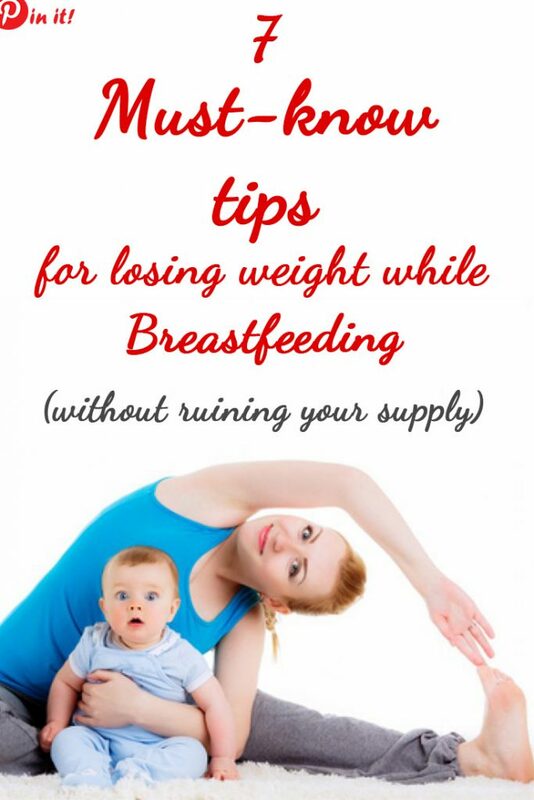 How can you lose weight while breastfeeding without jeopardizing your milk supply? Read on, mama. I’ve got all the answers covered for you! Here are 5 important things to consider if you want to diet while breastfeeding. Your body needs time to adjust to new functioning. Establishing a healthy milk supply usually takes two-to-three months after delivery. Believe me, you don’t want to mess with the calories before that period. Otherwise, you might seriously compromise lactation and your supply may be adversely affected by dieting within first months postpartum. Don’t make quick decisions. Eat well and rest instead. Breastfeeding goes first, after all! Instead of cutting down on calories too early, try breastfeeding on demand. Keep in mind, that breastfeeding burns extra 300-500 calories (actually the figures may vary between 200 and 600 calories, it all depends on individual properties of the body, the metabolism and genetics) because your body needs energy to produce milk! So if you breastfeed frequently and continue doing so over a half a year period, consider you’ve signed yourself up for a pretty cool weight loss plan (where you don’t have to sacrifice this small piece of cake once in a while). Breastfeeding on demand from the very first day postpartum will also ensure a healthy milk supply and help you get to the point of established lactation much faster. While you still can’t cut down on calories, what you can do is stick to a healthy diet. Eat 3 meals with smaller portions and snack in between instead of having 2-3 big meals a day. Cut out sugar, refined foods, fast food, and unhealthy fats. Snack on fruits, nuts, cheese and plain yogurt with berries. Add superfoods to your diet, like chia seeds, spirulina, spinach and ginger (which all contribute to your weight loss without you even thinking about it). Dieting while breastfeeding is perfectly save as long as your caloric intake doesn’t get lower than 1800 calories. Most mothers need even more than this number to sustain a healthy milk supply and nourish their bodies with nutrients. Continue eating a wide variety of nutritious food and keep in mind if you go below 1800 calories per day you may put your milk supply at risk. Every body is unique and for some women cutting out 200 calories a day would be enough to see results, others will need more than that. Although, when it comes to dieting while breastfeeding, you would want to cut your calories gradually not to result in losing milk supply. It’s no secret that protein makes you feel fuller for a longer period of time. As a nursing mother, your protein intake should be at least 65 grams per day (the figures may vary, depending on your weight, but I wouldn’t go lower than 1 gram per 1 kilo of your body’s weight), because you need protein to maintain a healthy milk supply. Opt for lean protein. Use protein from dairy in the first part of the day, since it can give you swelling if consumed in the evening. Also, forget about low-fat dairy. It’s just NOT a healthy option. For the second part of the day, choose lean meat, low-fat fish and eggs (or vegetarian sources of protein, such as soy, wide variety of beans, quinoa and wild rice). I’ve noticed many times that if I skip breakfast, the whole day is ruined. I guess, this happens because the brain and body don’t get enough fuel and nutrients. As a result, they can’t work properly. What happens if I don’t eat breakfast? Breakfast is crucial because it kickstarts your metabolism. If your body gets the right type of fuel from the very morning, you burn calories, a.k.a. you lose weight! oatmeal (slow carbs, also great for milk supply) + fruits (fast carbs, a.k.a instant energy + fiber) + nuts (healthy fats) = healthy and nutritious meal! Yay 🙂 You can also add some superfoods to the meal. And don’t forget to take you prenatals with the breakfast! I swear by Garden of Life Raw Prenatal Multivitamins. I’ve been taking them throughout my pregnancy and till the end of breastfeeding. Just LOVED them! I can’t say this enough. Water is essential for your body. Breastfeeding moms need even more water because they can easily get dehydrated from constant nursing-milk-producing cycles. And, guess what, dehydration can be easily mistaken for hunger! Frankly speaking, I’m not a fan of drinking pure water. I’ve always tried to add some ingredients to it so it would taste better. I used to add a slice of lemon into my water bottle and it was great. Once I tried a new verge of taste, adding ginger and mint to my lemon water and I completely fell in love with the taste. It was not until a couple of months ago that I found out ginger and lemon actually help your body to BURN FAT! A nice bonus to a product I already loved! If you exercise moderately while breastfeeding, your body burns more calories, so that helps lose weight and gain some muscles. It’s a win-win. You will look leaner and more fit. Start slow and wait at least until the 6 weeks postpartum threshold to start any kind of exercising, or until your doctor says you are ready. “Say no to empty-calorie foods like sodas and chips, as well as fad diets that eliminate entire food groups. Instead, fill your diet with a variety of nutrient-rich meals containing lean protein, whole grains, fresh fruits and vegetables and plenty of low-fat dairy products”, says Tammy Baker, M.S., R.D., a Phoenix-based dietitian and spokeswoman for the American Dietetic Association. Eliminating the empty calories will surely help for weight loss. It is also great to start counting how much calories you eat with your every meal. It is especially beneficial for those women who has never tried estimating what and how much they eat. Start with weighing the products you cook with. Write down everything you have for the meal with grams. Google for calories. Counting calories help you get the whole picture of what you eat, how much you eat and how healthy your food choices are. When you study your notes for the past week, it will be easier for you to realize what you did wrong and adjust your nutrition and caloric intake to a more suitable one. That’s pretty much all I’ve got. These are the basics. And they DO work well, especially if you adhere to all seven. Share your story of postpartum weight loss. Was it a tough journey or you managed to bounce back to shape with little effort? Do you have more useful tips for losing extra pounds for other moms? If so then do not hesitate to share. We’re all here to help each other!